Recover a Great Welkynd Stone for Martin. You are informed of the third item Martin needs - a Great Welkynd Stone. Explore the ruins for the Great Welkynd Stone. Fight the King of Miscarcand. Return the stone to Martin. Once you've found and brought the Armor of Tiber Septim to Martin, he'll let you know that the third ingredient he needs is a Great Welkynd Stone. This is a rare Ayleid artifact which - as far as he knows - can only be found in one place: the ruins of Miscarcand. He'll also warn you that the vengeful spirit of the last King of Miscarcand is rumored to guard it even in death. The ruins are marked on your map, halfway between Kvatch and Skingrad. A fairly standard Ayleid ruin dungeon crawl ensues, including undead battling a tribe of Bitterfish Goblins. Details on the interior of Miscarcand are provided on its page. Once you take the Great Welkynd Stone in Morimath, the King of Miscarcand (a powerful lich) appears in the hall entrance and two Zombie Guardians come up the now raised staircases. Defeat them or run away (although the second option is not ideal - see Bugs). If you do defeat them, there is a shortcut exit that can be accessed through a small room opposite the main hall entrance, which is populated by more Zombie Guardians. Exit Miscarcand and head back to Cloud Ruler Temple. It is possible to acquire the Great Welkynd Stone before reaching this part of the Main Quest. If you pick up the stone, it is permanently kept in your inventory as a quest item and Martin will immediately take it from you the next time you speak to him. However, giving both the Armor of Tiber Septim and the Great Welkynd Stone to Martin at the same time results in a glitch that, while not game-breaking, will be a great hindrance later on in the main quest. With both items in your inventory, there is no interruption in the dialogue between handing the two over, causing the script where Martin puts on his battle armor to be skipped. Because of this, Martin will head out to the Defense of Bruma battlefield still wearing his robes and armed with only an enchanted iron dagger. Keeping Martin alive during the ensuing battle becomes much more difficult as a result. An indirect workaround is to reverse pickpocket permanent Bound Armor and Weapons into Martin's inventory. Before you give the Armor of Tiber Septim to Martin, you must remove the Great Welkynd Stone from your inventory, using the command player.removeitem 000345AF 1. After handing over the armor, use the code player.additem 000345AF 1 to return the stone to your inventory. You will get a journal entry and Martin should don his armor. Talk to him again to turn over the stone. After you have given the Armor, you can type setstage MQ12 30, to make Martin don his armor. (If you want to get all the journal entries, you can instead type the following three commands: setstage MQ12 10, setstage MQ12 20, and finally setstage MQ12 30). If you choose to run from the King of Miscarcand and his Zombie Guardians, they will continue to chase you throughout Cyrodiil. You cannot fast-travel, wait, or sleep, as the game claims that there are enemies nearby, even though you may be miles from Miscarcand or invisible. You can fix this by traveling to any city and committing a crime. Pay your fine and you will end up outside the city's castle, where you'll be met by the King and his Guardians. The fight will be a lot easier than it otherwise would be because the guards will join in the fight. Once these enemies are dead, the game should return to normal. Entering an Oblivion Gate will also accomplish a similar effect. This has also been reported to occur even if the zombies have been killed. It is possible to escape being hunted down by the King of Miscarcand and his decomposing duo by remaining undetected before and after you pick up the Great Welkynd Stone. An Invisibility spell or potion may help, as well as a strong Chameleon spell or potion. You can also open the console and type player.scaonactor to cause every single enemy to stop attacking you, including the King and his zombies. Some of the doors in Miscarcand may not open properly when activated. 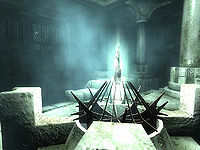 10 Martin has deciphered the third item needed for the ritual: a rare Ayleid artifact known as a Great Welkynd Stone. He knows of only one place that still might contain one, the Ayleid ruins of Miscarcand. I must find the Great Welkynd Stone of Miscarcand and bring it to Martin at Cloud Ruler Temple. 20 I have entered the ruins of Miscarcand. Now I must find its Great Welkynd Stone. 30 I have found the Great Welkynd Stone. Now to bring it to Martin at Cloud Ruler Temple. 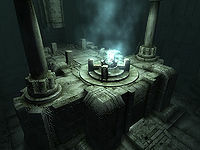 It is possible to use the console to advance through the quest by entering setstage MQ12 stage, where stage is the number of the stage you wish to complete. It is not possible to un-complete (i.e. go back) quest stages. See SetStage for more information. This page was last modified on 20 March 2014, at 06:08.